1 Remove crusts from the toast and cut or tear into small pieces and place in a bowl. 2 Peel onions and garlic clove and finely chop. Heat 2 tablespoons of oil in a pan and cook onions and garlic until softened, then add to the bread pieces. 3 Rinse parsley, shake dry, pluck leaves and chop coarsely. Add to the bowl along with the egg. 4 Season with salt and pepper and whisk with a hand mixer until smooth (or knead with your hands). 5 Rinse the squid tubes inside and out, clean well and pat dry. Use a piping bag (without a tip) to pipe the bread mixture into the squid tubes (or carefully fill with a teaspoon). 6 Close the openings with toothpicks and season the squid with salt and pepper. 7 Coat an aluminum pan with the remaining oil and place the stuffed squid tubes in pan. Cook on a hot grill until squid is tender, 12-15 minutes, then remove and serve. 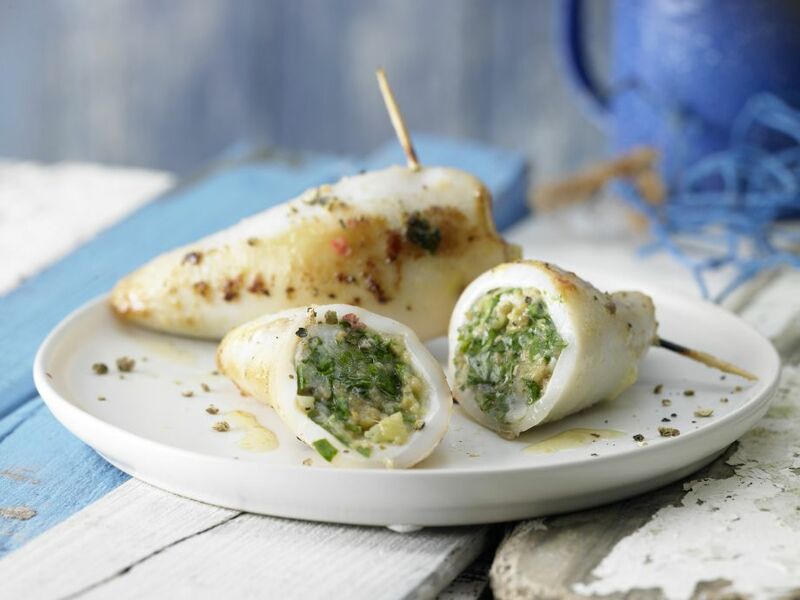 Challenging to make but delicious grilled squid. Perfect dinner dish.